SURABAYA, Indonesia -- For many, it was a family trip to Singapore to ring in the new year, a chance to go shopping and enjoy the city's famed restaurants. One family was going to visit their 15-year-old daughter, who had just begun studying at a Christian girls' school. Others were taking a familiar flight to a city they visited often for getaways. Nine bodies have now been recovered fromAirAsia Flight 8501, which crashed into the Java Sea on Sunday. Authorities announced Thursday that they had identified one of the bodies, flight attendant Hayati Lutfiah Hamid, using fingerprints and other means. Just 15, Chiara Natasha lost her entire family in the tragedy. Chiara's parents and two brothers were flying to visit her in Singapore, where she had just moved in early November to study on a Singapore government scholarship. The family had sent her off from Surabaya airport less than two months ago, promising to visit her to celebrate New Year's and help her settle into dormitory life at the Methodist Girls' School, said her aunt, Linda Patricia. Chiara, a petite teenager with long black hair, had flown back to Surabaya herself on Sunday - the day Flight 8501 went missing - and waited at the airport Monday and Tuesday for clues about the plane, praying hard that her family had survived. News that some wreckage from the plane had been spotted and six bodies retrieved left Chiara in shock and she kept crying when relatives tried to console her, her aunt said. Chiara didn't come to the airport on Wednesday. Her older brother, Nico Giovanni, 17, has been studying in Singapore since last year. He had returned to Surabaya for year-end holidays and was due to start his new term at the St. Andrew's Junior College, said Linda, who has been with her niece since her return. Chiara's father, Herumanto Tanus, was a 46-year-old accountant and Linda's youngest brother. Her mother, Indahju Liongsih, was a homemaker. Chiara's younger brother, Justin Giovanni, was 9. Many Indonesians use one or two names but no family name. "We are all heartbroken and Chiara still finds it hard to accept" her family members' deaths, Linda said. "I am thankful that the plane has been found. My only hope is that all their bodies will be found and evacuated no matter what the condition is so that we can have a proper closure." She said Chiara has agreed to eventually return to Singapore to study as she didn't want to disappoint her parents. "In Singapore is her future," Linda said. Khairunnisa Haidar, 22, had always dreamed of becoming a flight attendant. "We couldn't have stopped her," said her 60-year-old father, Haidar Fauzie. "From the start, we already know the risks associated with flying." His wife cried hysterically when they heard the flight had gone missing. They had been looking forward to their only daughter's return on Jan. 6. Haidar said they had visited her apartment in Surabaya earlier and found that she had packed everything neatly in anticipation of her holiday back in Palembang, on the island of Sumatra, and also had booked her ticket home. "She had asked my wife to make her favorite fruit pudding and a local vegetable samosa filled with carrots, potatoes and eggs," he said. 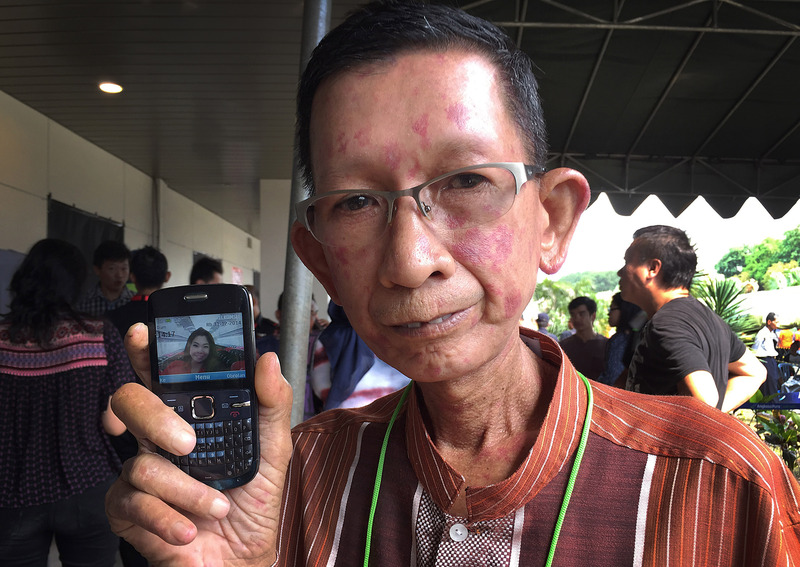 He showed a photo of his daughter on his mobile phone, posing in her red AirAsia uniform in an aircraft. "She is a filial, beautiful and smart daughter. It is a painful loss." Haidar said he was thankful for support from the airline and the government. "It is a natural disaster. Nobody is to be blamed," he said. "AirAsia is still the best." He was calm about his loss. "We accept God's will. She belongs to the Almighty. We will see her again one day," he said, with a smile. The tragedy appears to have hit Surabaya's Christian community particularly hard. Pastor Philip Mantofa of the Mawar Sharon Church in Surabaya was shocked to discover that 41 of the 162 passengers and crew were members of his church. He said it was it not unusual for many members to travel to Singapore for holidays. More than 100 people gathered as Mantofa led a service of prayers and songs Wednesday at the Surabaya airport. "Some things do not make sense to us but God is bigger than all this," he said. Counselors from the church hugged and prayed for relatives, including Linca Gonimasela, who lost her 13-year-old son, Adrian Fernando. It was supposed to be a fun trip to Singapore with his aunt, uncle and their 3-year-old daughter. All four were aboard the plane. Linca couldn't go on the trip as she had to work. "He is my only son," she said. "At first he didn't want to go but later on he was persuaded to join them for the New Year holidays." Charly Gunawan, a jovial textile businessman in his late 40s, was traveling with his wife, three children, his daughter's fiance and the fiance's mother - a group of seven. His family frequently flew to Singapore for vacations, and he had planned the trip as a special family trip for New Year's, according to his brother, Ifan Joko. As work got busy toward year's end, Gunawan considered skipping the trip but in the end decided to stick with the family holiday. "I know the plane has crashed but I'm still praying they are alive," Ifan said. "As long as their bodies are not found, who knows?" Gunawan liked to crack jokes, had many friends and often donated sacks of rejected clothing to the poor and needy, said a friend, Nasaruddin. "He is a good man," Ifan said. Capt. Iryanto flew F-16 fighter jets in the Indonesian air force before becoming a commercial airline pilot. He had more than 20,000 flying hours under his belt, of which 6,100 were with AirAsia on the Airbus 320. "Papa, come home, I still need you," Angela Anggi Ranastianis, the pilot's 22-year-old daughter, pleaded on the Path social-networking service late Sunday, which was widely quoted by Indonesian media. "Bring back my papa. Papa, please come home." He was also respected in his community, which had appointed him neighborhood chief the last two years, said Bagianto Djoyonegoro, a friend and neighbor. At Iryanto's house in the East Java town of Sidoarjo, neighbors, relatives and friends gathered earlier in the week to pray and recite the Quran to support the distraught family. Their desperate cries were so loud they could sometimes be heard outside where three LCD televisions had been set up to monitor the search for the plane. Just a week before the flight, accountant Lina Soetanto, 24, had surprised her mother, Ang Mie Jong, with vases of beautiful white roses for her 52nd birthday. Ang suffered shoulder pain for months while Lina had a painful urinary tract infection, Ang's best friend Susilowati said. They planned to go for medical check-ups at Singapore's Mount Elizabeth Hospital and had saved up for the trip, she said. Ang had brought her 12-year-old niece Thurza Aureliza along with her for the trip. "Indonesia is crying," said Pastor Hanny Lawantara of the Happy Family Center Church, which Lina attended. Throughout his career as an engineer for the energy company Total, Remi Plesel wanted to fly. So a few years ago, the Frenchman quit his job and learned to do just that. He got a job with AirAsia, and at the time of the accident he had earned 2,275 flying hours. He had been living in Indonesia three years, his sister, Renee, told France's RTL radio. She last had contact with him on Dec. 26. "Aviation was his passion and he was able to make it real," she said. "He told me that things were going well, that he'd had a good Christmas. He was happy. The rains were starting, the weather was bad, it was raining a lot. He was going to work the next day."